WHAT DOES HONG LOOK LIKE THROUGH THE EYES OF YOUTH, and what can we learn from their unique perspective? From October 22-30, 2005 The Robert H.N.Ho Family Foundation placed digital cameras in the hands of over 170 Form-Two students from more than 100 Hong Kong schools, used local photographers and art teachers to instruct them in the art of seeing, and sponsored a week-long photographic shoot. This book is the result of their outstanding efforts. There is a great sense of unity in these photos. 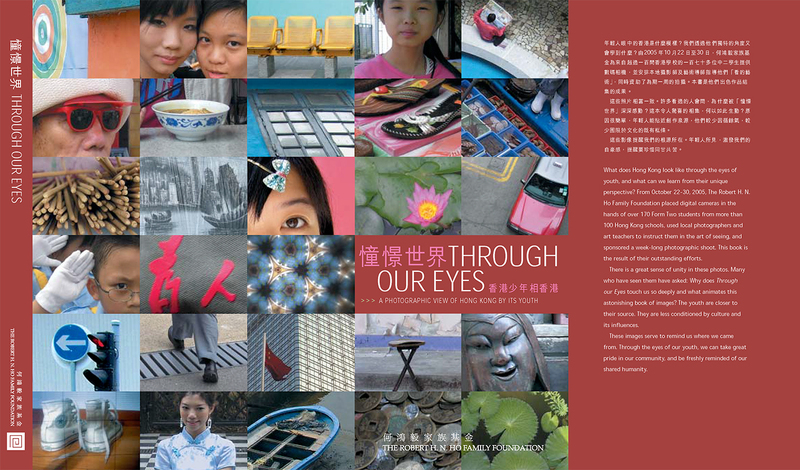 Many who have seen them have asked: Why does Through our Eyes touch us so deeply and what animates this astonishing book of images? The youth are closer to their source. They are less conditioned by culture and its influences. These images serve to remind us where we came from. Through the eyes of our youth, we can take great pride in our community, and be freshly reminded of our shared humanity.